The Big Steps series is designed to help little ones (and their parents or carers) with new everyday experiences. In We're Going to the Dentist, Nancy and Teddy go for a dental check-up. This novelty book with a sweet story has fun flaps to lift and mechanisms to move, as well as practical tips for parents and carers on each page, endorsed by leading Early Years Consultant, Dr.
Amanda Gummer. 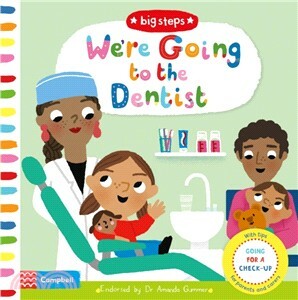 With delightful illustrations from Marion Cocklico, We're Going to the Dentist is the perfect book for sharing and reassuring little people. For more toddler tips, read We're Having A Baby, I'm Not Sleepy, No More Nappies, I'm Starting Nursery, Can You Say Please?, We're Going to the Doctor and I Can Get Dressed.